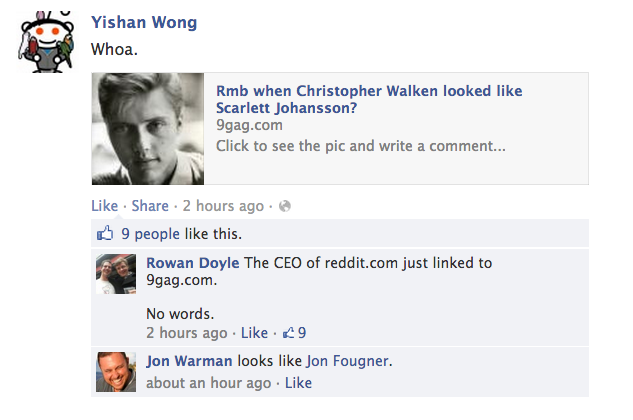 If Yishan Wong had been any old redditor sharing a link to 9gag, he’d have been lambasted for it. That he’s the company’s CEO only just exacerbates the issue. Wong shared a link on Facebook to 9gag, an image-based meme site, which showed just how similar a young Christopher Walken is in appearance to Scarlett Johanssen. The problem is 9gag is a sore issue for many redditors, with many claiming that 9gag pilfers posts, including original artwork, from Reddit and elsewhere. To make matters worse, the link directed to Imgur, an image-sharing site closely linked with Reddit, which should have been an indication that the Walken/Johanssen comparison was already on the social news site somewhere. A screenshot of Wong’s apparent indiscretion soared to the top of the front page on his own site. Another commenter simply linked to the satriical r/yishansucks subreddit. With this level of outrage at his flub, perhaps Wong might need a reddiquette refresher.